Autobotics is a sales, service, and consulting firm specializing in industrial robotics and plant automation. We have over 30 years experience and understand your needs. We provide specialized support and Robotic Consulting that most OEM’s do not, and can not offer. Our team will assist you in various facets of business to include Organizational Restructuring, Production Analysis, Technical Training, Team Building, Special Application Design which will strengthen your company. We are located in Claremore, Oklahoma and are serving many companies throughout the U.S. and International. Autobotics LLC specializes in robotic consulting and advanced system design with Fanuc Robotics and MOTOMAN Robots. Our organization is dedicated to giving our clients various options to solve their production needs. We support many robotic applications including, welding, plasma cut, flame spray, special coatings, painting, assembly and material handling. 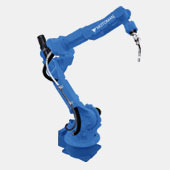 We are a diverse and successful supplier of industrial robots throughout the U.S.